My thoughts on books while sipping a cup of tea. So this week is actually supposed to be Red, White, and Blue Covers for Fourth of July but I am not really feeling that so I changed it. I think it would be so cool to see the Battle scene on the big screen! I have said this multiple times but I would LOVE to see this as a movie! It reminds me of Marie Antionette (2006) with all of the colors and the extravagance! I would love to see the scene from Venice on the big screen! And it wouldn’t even half to be a movie, it could be a short series like The Miniaturist. JUST USE THE BOOKS AS THE SCRIPT!!! Now I would need this to be a serial series because I need to sob and it can’t be a movie because there is no way you could fit that whole book into two hours!! I would love to see this as an animated series, I am thinking something like a 2D hand-drawn stop-motion look. And each chapter could be an episode. AND MADE I COULD GET MORE OF THE STORY!!! I really hope Wang does another book about these guys! I recently finished Crooked Kingdom (it was amazing!) and I would love to see Ketterdam and the Ice Court and my little smol beans! I am actually really surprised that there is not a GrishaVerse film/show in production. This I would definitely need as a series because I need all of the little details of their relationship! And this is where I could stop adding media to my blog post because WordPress decide it hates me so I am only doing 9 this week. Top Ten Tuesday is a weekly bookish meme by The Broke and The Bookish and is hosted by That Artsy Reader Girl. I need to read The Belles. It looks SO good. Brilliant list! Do it! I loved it! I ABSOLUTELY AGREE WITH ALL OF THIS! For the Six of Crows Duology though, I think it’d do better as a TV series! Yes, I can imagine it as a series but I’m okay with a movie if it is done well. I would love to see the Percy Jackson series made in to a GOT-style TV show!! It definitely needs a big budget because those movies were just NOT cutting it. It would be so worth it! I am sure that the producers could even do some crowdfunding and help fund it that way! I’m pretty sure Children of Blood and Bone is becoming a movie! I so agree with The Belles! It would look so magical! Nice topic! I’d love to see a good Percy Jackson movie or series of movies, and A Thousand Beginnings and Endings sounds good too! We deserve a better Percy Jackson adaptation darn it! It could have been so good if they’d just stuck to the books. Fabulous cover choices! I know! Hopefully, we get a better adaption soon! Thank you! I hope so, we deserve one! Interesting twist on the topic! I really want to read the Belles at some point! Happy reading! Fabulous cover choices! I love that Red Queen cover! The Belles is fabulous! Thank you!! Great, I’ll have to get to it soon! They already have a deal with Tomi Adeyemi to make CoBaB into a movie!! Let’s hope it’s finished soon!!! Yay! I know and let’s hope that they don’t change the story too much! oh please don’t ruin the movie!! 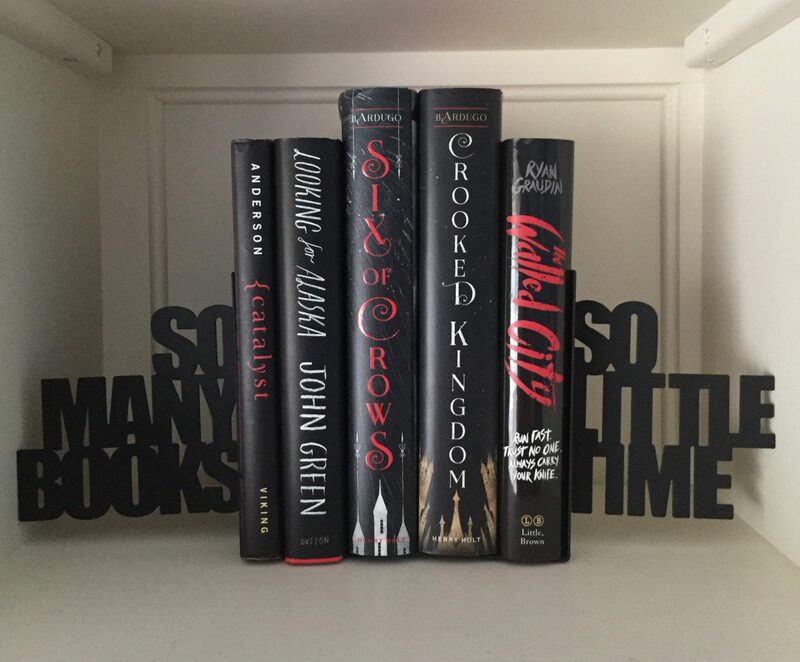 Six of Crows would make an amazing tv-series! I love Marie Antionette is such a beautiful movie. If The Belles reminds you of that, maybe I should read it! It is not exactly like Marie Antionette but the candy colors and the palace life are both strong similarities in each story. Okay, so I think I would love to see 80% of the books I read turned into a movie, it would be soo cool !! Great idea and phenomenal choices. Also, I agree with your point regarding Percy Jackson. That series had so much more potential. I love the adaptability of the people who participate in this weekly meme. Gorgeous covers and great books this week! It’s so difficult to make a good movie from a book, but it would be nice if they did a good job with some of your choices! I would love to see Children of Blood and Bone, The Belles, Six of Crows, and The Wrath and the Dawn turned into movies. Though a part of me wonders if they could do any of these justice. Great review! Yes! I’m going to be starting Gentleman’s Guide as soon as I finish my current book. I’ve heard good things about it. It is fabulous! I can’t wait for Lady’s Guide to come out! What a cool post! 😀 I agree completely with most of these (I haven’t read a couple like Wrath and Dressmaker). And I can’t wait to see Children of Blood and Bone’s movie! I’m dying for a Grishaverse series! I’m surprised it hasn’t been done yet. And, of course, I’d be more than happy to have a Percy Jackson remake.